This is part two of a three-part post. Here you will find part one and part three. We started towards Marcy Peak. We were getting pretty hungry by now. I was just slightly ahead of schedule on my food consumption, having eaten about half of my energy bars. The trek up to Marcy was much more enjoyable than the earlier summits. It was sunny and breezy, there were a few clouds around but they didn’t look too threatening. When we got to the top there were a lot of people around. We stopped and had lunch (tuna on rolls). This was the only “real food” we brought. All of our other food was in the form of energy bars or granola bars. We were somewhat surprised to see that we both had five bars of cell service on top of the peak, so we called our girlfriends who were on their way up to Lake Placid for the afternoon. They were going to wait for us at the Keene Valley trailhead that night. On the way down from Marcy Peak I had to stop and put some moleskin on my feet, as the excessive pace (especially on the downhill) was wearing my feet out pretty badly. I also took the opportunity to cut off my boxer briefs in an effort to slow down the chaffing I was experiencing. We did a quick calculation and figured that we were at most an hour behind schedule. We hiked off Marcy towards Haystack. When we got to the trail branch towards haystack we decided to bypass it because we were behind schedule. We trekked past Little Haystack towards Basin. It seemed like it took forever to get to the bottom of the valley between Haystack and Basin. The way up to Basin was even worse. We thought that we planned the technical parts of the hike in the beginning, and that the last few peaks would be close together and relatively easy. Basin was not easy. It was steep and required a lot of hand-over-fist work. 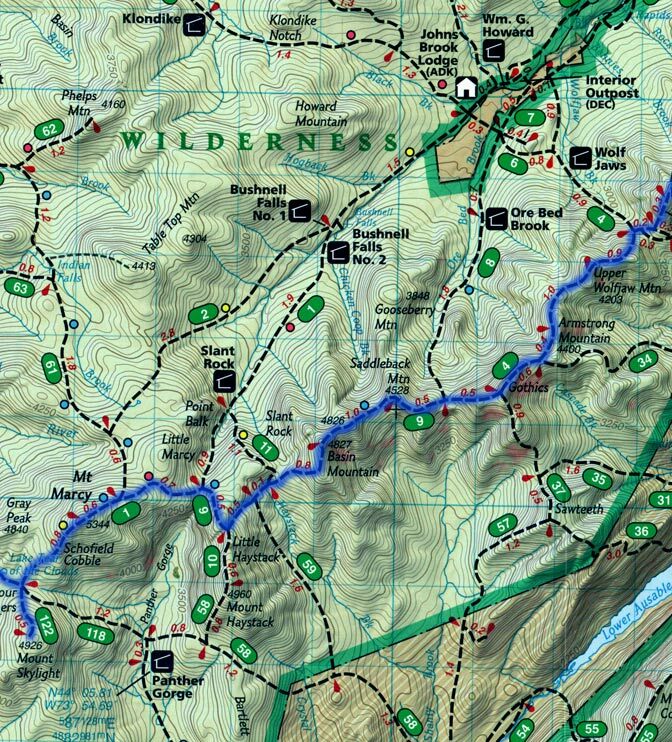 We talked to some hikers who had just traversed the Great Range and started in Keene Valley, the place we were ending our hike. We chatted with them for just a few minutes, and learned that they took three days to hike across the whole range. We realized we may have gotten in over our heads, and decided to pick up the pace. We decided uphill was the only safe way to make up time. Because we were so tired at this point, pushing ourselves on a downhill stretch was likely a recipe for injury. If you trip while hiking uphill it’s usually not such a big deal. Slip and fall on the way down and you’re liable to break something. We peaked Basin, spending only thirty seconds on top to take a picture, then headed towards Saddleback. The elevation change was absolutely brutal. We really underestimated how much elevation change was involved between the last few peaks. The sun was getting low in the sky, and we were really discouraged. The backside of Basin was no kinder than what we just hiked up. This stage of the hike took a lot of mental energy to make good decisions about foot placement and speed. The last thing we wanted out here was an injury. Although we did have bailout points planned and knew where several Lodges were that could radio for help, the nearest one was still several hours away. We started up Saddleback and traversed a long stretch of steep elevation gain, some sections I would have considered actual rock climbing, as using your hands was required. When we got to the peak of Saddleback we were pleased to see that the sun seemed to have moved only a small amount. Around this time, our five-minute breaks seemed to be losing their effectiveness. The next peak in line was Gothics. We were hoping this was the last of the major elevation change. When we reached the peak we had trouble locating the peak marker, but we didn’t want to waste any time, so we kept moving towards Armstrong. According to the map, Armstrong was the highest peak we had left. After that they got progressively shorter. To our surprise this was another relatively small elevation change. We reached the peak and again, couldn’t find the peak marker. We started towards Upper Wolfjaw. It took what seemed like forever to hike down off of Armstrong. When we reached the bottom, the hike up Upper Wolfjaw looked tremendous. There was minimal vegetation and we could see the narrow trail placed neatly on the steep rock face. We thought the hardest part was over, but soon realized this was the toughest mountain yet. When we got about a half mile up the trail we ran into large steel cables. The hike up was so steep that there was a system of steel cables leading the whole way up. This was kind of nice in a way because it allowed you to get in a rhythm and just keep trucking up the mountain. Plus my forearms were much less worn out than my legs, so it was nice to split some of the work with my upper body. Nonetheless the steep elevation gain wreaked havoc on my energy. My heart rate was really high at this point, but there was no good way to rest because it was so steep you just ended up holding yourself up if you stopped, which was not restful at all. I knew the only way to take a break was to reach the top. When we finally got to the top, we found a peak marker. What we found was the biggest morale killer of the trip. The peak marker clearly read “Gothics.” We thought we were on Upper Wolfjaw, but realized that those two not-so-bad peaks after Saddleback were false peaks on the way to Gothics. This hike was going to be a lot longer than we thought. You can read the last and final stage of our hike here. Posted by Hal on Monday, July 28th, 2008 at 12:26 and is filed under General, My Life and Family.